Learn how to dance like a robot in this video tutorial! Robot dancing is really all about dime stops from popping dance style. 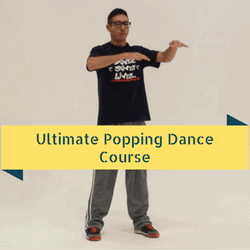 In this video you will learn how to dance the robot easily with foundational popping concepts. Learn how to dance popping and locking with step by step video lessons. You will learn hits/popping, waving, robotics, gliding, vibrating, slow motion effects and more. 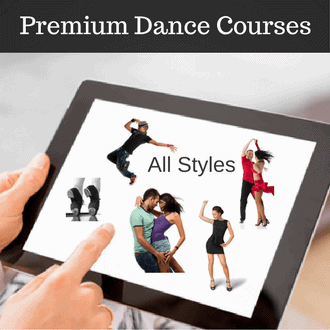 Become the freestyler you always wanted to be and impress your friends with your dance moves. Includes 3+ hours of video lessons. You can download it instantly or stream it online here. If we go to one of the purest forms and definitions of popping, it is actually to act or imitate as a robot. Robotics is all about dime stops. So dime stops is another huge fundamental dance style of popping. And it is the ability to freeze at a point in time. Now technically speaking, you don’t even really have to hit to do dime stops. It’s more of just about the freeze. You definitely see a lot of poppers do a miniature hip when they dime stop. Dime stop is definitely used a lot in robotics and I think it’s a great tool to use to develop patience when you dance. Starting out, it’s really easy to get caught in, “I got to do this. I got to go over here and do that.” But dime stops force you to freeze. So practicing dime stops can develop patience which is an awesome thing to have starting out. So dime stops are I think a really easy move you can do on the first try. It’s just about freezing. So I’m going to give you a pattern to follow. Start with the left and the right arm to match it. And I’m just going to pick four corners. So I’m going to go left, down, down right, right. Pop. Now, I want to add a little bit more. I’m going to start using my heels to turn. Heels. Head. Robotics is actually I think one of my favorite dance styles. I found myself roboting throughout the whole day. Roboting is definitely something that you can take your natural day-to-day movements and turn that into robotic style kind of dime stops. So for example, let’s say I’m at dinner table. That’s the way I’m going to sit down. I put my arms out, set my plate right here, instead of just reaching out to get my fork and grab, I can go. So really, it’s just about using a regular way of doing things and thinking like a robot and using dime stops to kind of beat your communication for interpreting that as a dance. I want you to think of a natural thing you do every day whether it’s brushing teeth or [0:02:26] [Indiscernible] and interpret that right now as a robot. If you were a robot, how would blank? OK? Fill that spot in. And we’ll catch you guys again.